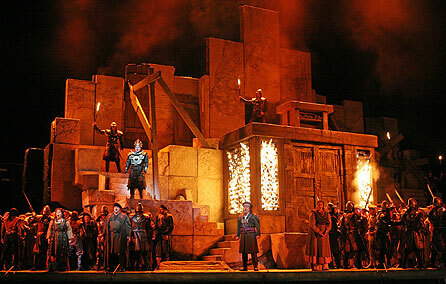 Today's opera in HD from the Metropolitan Opera was Verdi's Nabucco. The presence of Plácido Domingo in the cast meant that the theater was much fuller than usual. I want to say before I get lost in plot explanations that James Levine was in form. His conducting shaped this wonderful performance. I often enjoy regie performances, especially when they are looking for a modern interpretation of historical plots. This may possibly be my first traditional production for Nabucco. In particular the first scene, shown above, was far more dramatically clear than a modern production could ever manage. We know we are in a place of worship, here the temple in Jerusalem, because all the men are wearing their prayer shawls, white scarfs with black stripes. I liked this detail very much. The scene ends with the Babylonians setting fire to the sacred scrolls. The priest manages to save a set to take with them to Babylon. This may or may not be historically accurate, but it corresponds to what is believed. The story both does and doesn't correspond to Biblical narrative. I'm not sure there is any basis for the daughters Abigaille and Fenena. The insanity of Nabucco is from the Bible. Domingo does an excellent job of portraying insanity and climbs convincingly up and down the stairs, though once he did crawl up. He sang the madness aria lying face down on the floor. There is a romance, of course. We find at the beginning that both daughters are in love with the Jewish envoy Ismaele whom they met when he came to Babylon. Fenena rescued him, and now he is returning the favor. I enjoyed Russell Thomas in this role, though most of his singing is in the first scene. Jamie Barton was good throughout but was especially gorgeous in her last act aria. Abigaille, sung brilliantly and very dramatically by Liudmyla Monastyrska, is what makes this opera stand out from the crowd. For some reason she has managed to convince the public that she is the daughter of Nabucco while in reality she is the child of slaves. When Nabucco goes mad, she becomes ruler. When Nabucco recovers from his insanity, he converts to Judaism and overthrows Abigaille. All of this plot is enhanced by costumes which match our imagination of the Biblical story. Another outstanding feature of the opera Nabucco is the spectacular choral work. There is chorus throughout the opera, but the peak is, of course, "Va pensiero." What a glorious performance, which was given an encore. In Italy the encore is traditional. The audience sings along. We tried, but were hindered by not knowing the words. I hope everyone enjoyed this as much as I did.